APCO's gliders are backed by 6 month complete warranty on manufacturing and material defects. In addition a 3 Year / 250 Hour warranty. on cloth is included as standard. APCO provieds a wide variety of after sales service and support for your paraglider and accessories. You should have your paraglider checked annually by someone certified to do so. 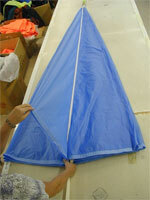 It is also recomended that you have your emergency parachute checked and repacked once a year. Together with check up service, APCO also offer repair and maintenance service for all equipment manufactured by APCO. Note: Before returning damaged equipment to our factory for repair or check, please consult us for precise return shipping instructions in order to avoid delays and additional custom release fees to your customer. Please include a copy of original invoice and letter describing damage and the ecxact nature of the desired repair.